We are prepped and ready to leave for Isle Royale. Early tomorrow morning, we will make the 12-13 hour drive to Copper Harbor in order to board the passenger ferry Friday at 8 am. 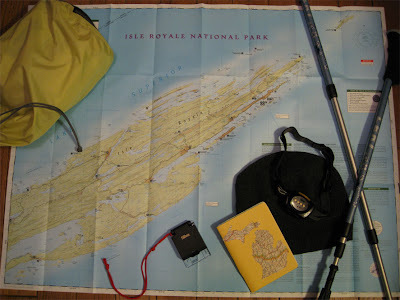 We should arrive at Isle Royale around noon, weather permitting, and plan to spend 8 days hiking, camping, taking in beautiful scenery, and hopefully viewing some wildlife. We've heard stories of recent bad weather (On Lake Superior? There must be some mistake.) and of people getting stranded due to the ships being unable to sail and the sea plane being grounded. Hopefully we will be able to travel to and from the island without incident, but if I don't show up for work on Monday 9/14, I'm probably hunting for berries in order to stay alive in the rain and fog. I will be taking a 4-5 day Colors trip with some friends in the first week of October. A girl's trip to the U.P., or possibly the Cadillac area. I'm enjoying your blog, and thought that maybe you could recommend places for us to see. We're going simply go get away from it all and enjoy the beauty of Michigan. Thanks. Sorry for the delayed response. If you are thinking of the Cadillac area and want to go hiking, the Manistee River Trail would be awesome. I would love a chance to get back there during color season. Also, Hartwick Pines State Park (near Grayling) is also very nice. Regarding the U.P., the Porcupine Mountains would be beautiful. If that's too far, maybe try Tahquamenon Falls State Park. Have fun - October is my favorite month! Though I'm late in checking back for your response, I will remember it for next fall when we go again. It was beautiful and we had a blast. Thanks for getting back to me.